My first impulse was to chuckle. Like so many of the current gaggle of Republican presidential wannabes, Godfather’s pizza magnate Herman Cain had said something so outlandish, so over-the-top, that I smiled not only at the thought of his press people scrambling to issue their inevitable explanations and clarifications, but also at the comedic opportunities presented by yet another modern Republican inadvertently revealing a medieval mindset. Yes. I know. Priceless. Hysterical. Downright Bachmannesque. For me, that was that. Politician makes shockingly ridiculous comment. I write snarky tweet. No one reads tweet. Sun sets. New day dawns. Repeat. Except this time, someone did read my tweet, and while her response suggested she failed to see the humor in my comment (I’ll admit, it wasn’t my best work), it also jolted me back to the undeniable reality that as shockingly ridiculous–indeed, as cruel–as Cain’s words may have been, those words were not a gaffe. Cain not only meant what he said, he was speaking for a sizable, like-minded constituency. So they’re still at it, those label-savvy conservatives–and they mean it! If you’re poor, it’s your fault. If you’re sick, it’s your fault. If you’re unemployed, if you lose your retirement fund in a stock market meltdown, if you can’t send your kids to college, if you can’t afford health insurance–you’ve got no one to blame but yourself! It’s your own damn fault! The irony, of course, is not merely that the meme is untrue, but that those who spout such a mantra would likely hate for it to be true, lest their own success be diminished by a horde of equally capable, equally fortunate competitors. Undoubtedly, our culture–any culture–is not bereft of sloth, but human beings are not produced on assembly lines. Some people are smarter than others, some are stronger, some are quicker. Our aptitudes differ, our talents diverge. Which is why three people can put forth precisely the same level of effort and determination–can exercise precisely the same level of “self responsibility”–with one succeeding spectacularly, one succeeding modestly, and one not succeeding at all. Having less ability than the next person is neither one’s fault nor a failure of “self responsibility.” Nor, for that matter, is having less luck, or being born into less fortunate circumstances. Success is not always a measure of one’s effort or worth, and neither is failure. 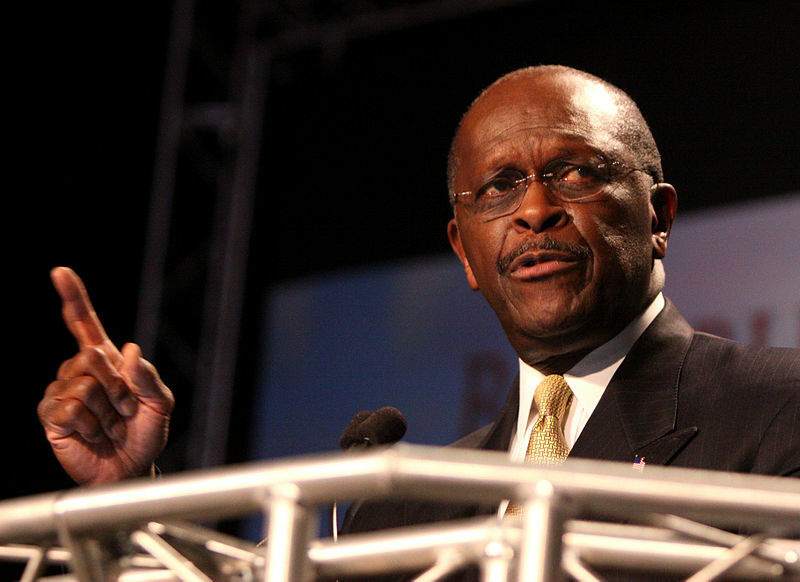 By insisting on the contrary–by insisting that anyone in need carries the blame for that need, or somehow lacks “self responsibility”–Herman Cain and his like-minded constituency betray a callousness toward humanity and to the randomness of life that is, in this writer’s opinion, as pitiful as it is amoral. And to anyone who feels otherwise: I feel for you. 8 Comments on Blame Yourself! Is there any way I can request a post be more about shallow subjects like celebrity train wreck culture or something. Your grammar seems excellent and your thoughts probably provoking….just a touch over the way above over point of my head. Am I, too, somewhat Bachmannesque is my request? I’ll try–but I make no promises. Perfect response to not only Herman Cain’s outlandish comment but also to that tweet. Your words/rhetoric is inspiring, so keep them coming! Also, I would love to know you thoughts (potentially another post) on the Occupy Wall Street. Sorry, I just love your opinions because we agree on everything but you always bring something different on the table to consider. Thank you so much, Laura–the feedback is nourishing. I’m actually working on a piece on Occupy Wall Street which, barring something in the news that pulls me to another topic, should be posted by early to middle of next week. I love your posts. They always make me think. And this one I’m posting on my wall. Great Post! Very Insightful! Thanks!